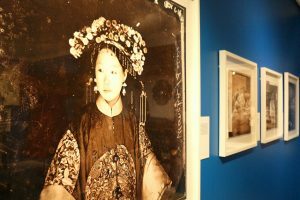 Multimedia author and exhibition video blogger, Yang-May Ooi, talks about the special section of the John Thomson Exhibition dedicated to the women of Old China. There’s still time to catch the John Thomson Exhibition if you act fast! The exhibition closes 23 June 2018 so you have a week left to go and see it at the Brunei Gallery in London – it’s free. In this video, I share my personal response to the special room at the John Thomson Exhibition dedicated to the women he photographed during his travels in Old China during the 1860s. It is a unique glimpse into the private world of high born women in bound feet as well as the working women of that time. Copyright 2015 John Thomson Exhibition; Wellcome Library, London.